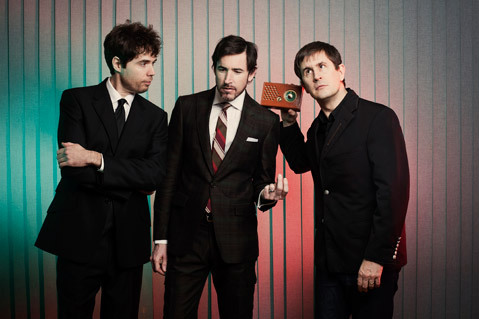 Mountain Goats are (from left) Jon Wurster, Peter Hughes, and John Darnielle. Whether you revere the Mountain Goats’ early, über-lo-fi catalog, or relish their newer, fully orchestrated shtick, there’s one thing all fans can agree on: the lyrics. The longtime project/namesake of frontman John Darnielle, the Mountain Goats have always been a thinking man’s band, and their latest release, All Eternals Deck, is no exception. Over the course of its 13 tracks, Deck highlights Darnielle’s signature fiercely controlled speak-sing and dexterous storytelling skills while still pushing the band in new directions. Today, the Mountain Goats are a fully fortified three-piece (bassist Peter Hughes and Superchunk drummer Jon Wurster round out the mix), and though Darnielle is still at its center, the sound and feel of what they’re producing is undeniably fuller than it’s been in the past. Below, Darnielle talks writing, recording, and fleshing out All Eternals Deck. All Eternals Deck doesn’t read as obviously themed as a lot of Mountain Goats’ albums. How would you compare the writing process for this record to those that came before? I had this thing about three-word titles going in, I had noticed a few in a notebook I keep with titles in it, and I thought, “What if I made this arbitrary three-word title rule?” — which got me thinking about numerology and the weird ways people think about numbers and ascribe power to them. And every time I’d write a song, I’d sort of have that mood, that mystic-thoughts sort of FATE-magazine feeling running like a background noise in my head. But apart from that, I was telling discrete stories, self-contained songs that felt like they had a clear visual narrative, like little cinematic moments. Which is different from The Life of the World to Come; I had a specific series of ideas I wanted to confront and explore, and The Sunset Tree — obviously I’m writing about myself and my family. This was more like shooting a film. Were there any specific catalysts or driving forces behind this record for you? My wife and I moved across town right before I wrote the first couple of songs for it. Moving into a new house always breaks something open for me. Something about being in a place that isn’t familiar yet always seems to shake something loose for me. “High Hawk Season” is this beautiful mid-album surprise. Can you tell me a bit about how that came together? That was the first one I wrote after we moved! It was just a guitar-and-voice song, but I knew I wanted to work with Dan Perry, who wrote the vocal arrangement, and that song had some space in it — hanging chords with what sounded like room for movement, so I sent it to him and he sent back a rough sketch and I thought, ‘yes ok EXACTLY.’ And Brandon Eggleston, who produced the track, flew with me Boston where Dan lives and we knocked it out in an afternoon at Q Division [Studios]. The three of them were singing that arrangement live — I have a picture of it somewhere. [It’s] such a joy to hear three-part harmony live in a room. Is this a signal to more experimental arrangement ideas to come? Maybe even expanding the touring band? Well, the touring band’s already up to four — who knows what else could happen. It would be way cool to be able to have an expanded vocal component because I feel like that’s pretty unusual now. I do have some pretty far afield stuff in the quiver for spring of 2012, stuff I’m writing presently. The first thing that struck me about this record is just how tight and organic the band sounds. Can you talk a bit about your writing process and how/when Peter and Jon come into the fold? I write by myself — that’s always been a solitary practice. But in the studio, we do track much of the basics live — the guitar bass drums and vocal are all live there, for example, and as often as not the core of the track is all being played live. We tour so much that, I don’t know, I feel like there’s a jazz or jam-band sort of natural quality to how we arrange songs now. I’ll just come in with one and they’ll fall into place and we’ll play it for a while, just listening, following the mood to see where it goes. There’s this reoccurring troubled actor/actress thing going on throughout All Eternals Deck — “The Autopsy Garland,” “For Charles Bronson,” “Liza Forever Minnelli.” How did these characters fit into your grander ideas about the album and its message? I think it is that I relate to them in some way, that is has something to do with childhood and with channeling early trauma into visions, into dreams you somehow bring out in your work. I think in some sense it’s the appeal of tragic figures, of people whose difficulties are also the source of their triumph. You’ve spoken about how you envisioned the Mountain Goats as a fairly small project, something that not a lot of people would hear. Are you comfortable with the idea of 19,000 people following you on Twitter? In my head when I’m writing, it’s still always a small thing — I don’t think of myself as a guy who’s got 19,000 people interested in hearing what I have to say. I sort of always cling to the idea that whatever I’m writing, I’ll just be playing at the Pitzer open-mike night on Sunday. It’s kind of a meditative practice keeping that scenario in mind, but I think when songwriters start thinking, “I have something to say now. Lots of people are listening,” that’s almost always bad for their craft. Clem Snide have a song about this called “Moment in the Sun.” For me, it’s sort of crucial to imagine that I’m working in secret, that nobody’ll ever hear what I’m doing. Mountain Goats play SOhO Restaurant & Music Club (1221 State St.) on Friday, June 24, at 8 p.m. Call 962-7776 or visit clubmercy.com for tickets.